I’m very pleased to announce the beta version of the NEW MuscleHack App is here for you to download. The point is to get feedback, both positive and negative, in order to improve the app before it launches in the Google Play store. So….test, test, test! The developer (Cedric) and I need your input! The app will create a shortcut to your current workout at the front on the Workout tab. So if you’re on Week 3 of ‘THT Volume 8-12 Reps‘, you can go straight to this page from the front of the workout section to save you having to navigate a few screens to get there. When a set is complete, it will turn blue. When a workout is complete, it will turn blue. Record how many reps you got after each set and click ‘Rest’ so that the timer will begin to count down to your next set. All set rests are defaulted to 2 or 3 minutes (you can customize this if you wish). A sound will prompt you to begin your next set. Also, you should receive a notification any time a new article is published here. So please test that for us also. To install the application, click the download link below. Transfer this folder onto your mobile phone sd card. On your phone you should have a ‘My Files’ folder or something similar. In there, go to the folder MuscleHack_v0.7 folder and inside click ‘MuscleHack.apk’ to install. (If a message comes up about the danger of installing an app outside of the Play store, go ahead and allow it. It’s safe; trust me). Then your app will appear for you to open and use. 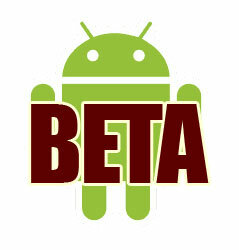 NOTE: This is only a beta phase version tested on android 2.2 and 4.2 only. We need new users to test it on other android devices before putting it in the Google Play store. 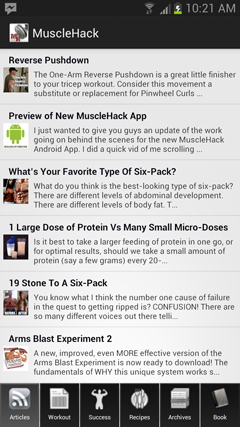 Leave your feedback with us at MuscleHack For Android and don’t forget to mention your android version/device as well. Sounds great, can’t wait for the iOS version. This is awesome! I fell of the wagon, time to get back on! From a quick view its a decent app, however I don’t like the workout logger, it is too messy and simple for me, a few improvements I would suggest is that make it a bit more colourful and professional looking, the rest time counter should also look more appealing, the current set you are doing should be the main focus on the screen rather then a list of sets, the blue-green highlight to show the set is done could be changed to a more appealing graphic e.g an animated graphical cross with similar colour to the ‘MH’ on the app logo. everything else is pretty decent and easy to use. hope to see the app in ios version! Bytheway I cant find THT 3-Day split logs.Could you please add them too, some of us really need it. I reckon the app looks great! * Main thing I’d like to see is the ability to change the names of exercises – for those with limited access to equipment or injury/mobility issues. The workout would be essentially the same, but easier to keep track of for those that need to substitute. * The other thing I’d like to see is for it to automatically calculate 1RM’s – just a nice way to calculate progression. eg. If someone previously lifted 35kg*10, then next time did 40kg*7, have they progressed? * Also, I’d love to see the 3-Day Split in there too! Cheers, and thanks for your great site! My error, didn’t have any unzipping software installed! There is a problem with the count down feature in the workout logs, as in its not counting down correctly. It counts down but very erratically eg it will start at 180 then count down 179,178,177 all in the space of a second or so. So the 180 secs is only taking around a minute to count down.